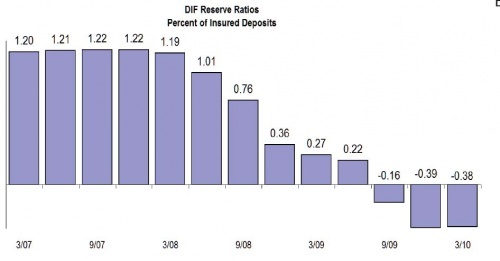 Today we received an update on the solvency of the FDIC. This is the company that backs the savings in your bank account. You are reading it correct. The number is below zero. Not only do they have $0 available to back the savings deposits, they currently owe $20.9 billion. So who backs the FDIC? The Federal Government. The Federal Government is currently $13 trillion underwater and borrowing $2 trillion every year to stay solvent. Who backs the Federal Government? The Federal Reserve. With a printing press. There are many tools an investor can use today to try and piece together clues on the direction certain markets are heading in the near future. One of the best of the sign posts to watch over the past 12 months has been the activity in the Credit Default Swaps market for country debt. "CDS" are a fancy word for insurance for debt. If you want to buy a house the mortgage company asks that you own insurance on the house to protect their investment. An astute investor in the real estate market would track the cost insurance companies charge homeowners in various parts of the country. If they charge very high rates to insure a home, it means they feel it is a risky investment, and that the likelihood of default is higher than in other areas or investments. The same applies for CDS; country debt insurance. If an investor decided a few weeks ago to purchase some debt in Greece and they wanted to buy some insurance on that debt just in case Greece were to default, the rates on the insurance were extremely high. 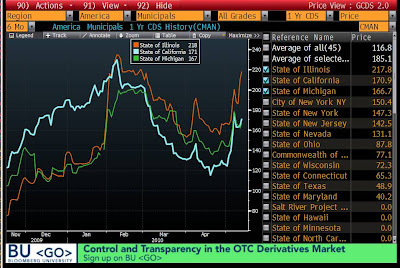 This was obvious a week ago, but the astute investor was watching the CDS insurance rates rising back in late 2009. You could smell the smoke coming from Greece back when CNBC was still reporting about the record bank profits. So the important question today, (and moving forward) is what is happening in the CDS market right now? The big money (the smart money) moves in early and shorts (bets against) the CDS market before the public becomes aware of the problems. Last week we saw the largest short position by far taken against the UK. The second largest was in France. The big money has moved on from the PIGS (Portugal, Italy, Greece, Spain) and is now moving toward the larger names. They are betting that the contagion will continue to spread beyond the Euro Zone's control. I have been talking for weeks about the order in which countries would be attacked. I felt that it would begin first with the PIGS, then move to either Japan or the UK (we got that answer this week), and it would finish with the United States. I assumed that when they attacked the United States, they would begin first with the state debt before taking on the ultimate monster: The US Federal debt. The $107 trillion looming disaster. Illinois is now expected to be the first state to fail (or more likely: receive bail out) due to the fact that they have already stopped making many payments. California will follow soon after and Michigan will be right behind. So have no fear, all the fun and excitement overseas will soon be within our own borders, and the debt problems in the United States are far worse than any other country in the world by far.